Edom is the country that was established by the descendants of Esau, who was Jacob's brother. Edom means "red" and was a name by which Esau himself was called. The nation of Edom was often antagonistic towards the people of Israel. Edom ceased to exist as a definable people within a few centuries after the Romans suppressed uprisings for Jewish independence in the land of Israel about 2000 years ago. Edom was near the land of Israel, to the east of Jerusalem, between the Dead Sea to the north and the Gulf of Aqaba to the south. It's most famous city was Petra, which featured many buildings that are carved into rock. 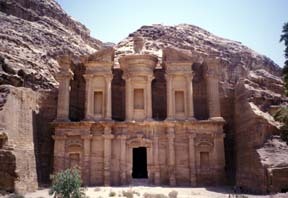 Petra, and the land that once was Edom, are now part of the country of Jordan. Edom is mentioned in a list of Sethos I of about 1215 BC. It is also mentioned in the records of Rameses III. Edom would not allow the Israelites to use their roads on their way to Canaan (Numbers 20:17-21), and Aaron died on Mount Hor near the Edom border. Although Edom and Israel were related through Esau and Jacob, there was constant warfare between the two countries. David was the first Israelite King to conquer Edom. Edom revolted in the days of King Joram, installing its own king. Years later, Amaziah re-conquered Edom, and it was not until the days of Ahaz that the country regained its independence. In the 6th century BC Edom was conquered by the Babylonians. The years following its downfall, the country was overrun by nomadic tribes, which forced the Edomites westward into southern Judah, south of Hebron. The area became known as Idumea, and in 135 BC it was conquered by John Hyrcanus who converted them to Judaism. King Herod was an Idumean of Edomite origin. Edom was condemned by the prophets, especially Obadiah, who devoted his 21-verse Book to foretelling the eventual destruction of the country. Edom appears in 86 Bible verses: Gen 32:3, Gen 36:16, Gen 36:17, Gen 36:21, Gen 36:31, Gen 36:32, Gen 36:43, Ex 15:15, Num 20:14, Num 20:18, Num 20:20, Num 20:21, Num 20:23, Num 21:4, Num 24:18, Num 33:37, Num 34:3, Josh 15:1, Josh 15:21, Judg 5:4, Judg 11:17, Judg 11:18, 1 Sam 14:47, 2 Sam 8:12, 2 Sam 8:14, 1 Kgs 9:26, 1 Kgs 11:14, 1 Kgs 11:15, 1 Kgs 11:16, 1 Kgs 22:47, 2 Kgs 3:8, 2 Kgs 3:9, 2 Kgs 3:12, 2 Kgs 3:20, 2 Kgs 3:26, 2 Kgs 8:20, 2 Kgs 8:22, 2 Kgs 14:10, 1 Chr 1:43, 1 Chr 1:51, 1 Chr 1:54, 1 Chr 18:11, 1 Chr 18:13, 2 Chr 8:17, 2 Chr 20:2, 2 Chr 21:8, 2 Chr 21:10, 2 Chr 25:19, 2 Chr 25:20, Ps 60:1, Ps 60:8, Ps 60:9, Ps 83:6, Ps 108:9, Ps 108:10, Isa 11:14, Isa 34:5, Isa 34:6, Isa 34:9, Isa 63:1, Jer 9:26, Jer 25:21, Jer 27:3, Jer 40:11, Jer 49:7, Jer 49:17, Jer 49:20, Jer 49:22, Lam 4:21, Lam 4:22, Ezek 25:12, Ezek 25:13, Ezek 25:14, Ezek 32:29, Ezek 35:15, Ezek 36:5, Dan 11:41, Joel 3:19, Amos 1:6, Amos 1:9, Amos 1:11, Amos 2:1, Amos 9:12, Obad 1:1, Obad 1:8 and Mal 1:4.